On behalf of our Interim Director of Bands, Professor James Holden, Jr. and the entire Trojan Explosion family, I extend Greetings from the Land of Troy. Please note that band camp begins on Sunday, August 3, 2013 for new/incoming members. Registration will take place from 9:00 – 11:00 a.m. During this period you will check in at Davis Hall, pay your band dues (cash or check), be issued a locker and most importantly move into your assigned residence hall. 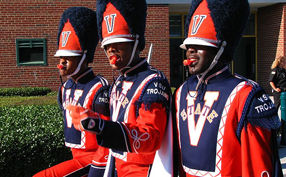 VSU will only provide housing for students who will be residing on campus throughout the academic year; you should receive your housing assignment prior to band camp. We have allotted ample time for students to move in, clean, have lunch on your own, visit the local stores and any other things that you may need to do before coming together to meet with staff. Incoming members residing off campus, including a VCCS campus (Bland, Reynolds, Tyler, etc.) during the academic year will report for registration at 2:00 p.m. at Davis Hall. Everyone will report to the band room on the ground floor of Davis Hall for a meeting with students and family at 3:00 p.m., during this period you will be introduced to staff members and we will go over the specifics of band camp. After this, family members may depart and we will have dinner at Jones Dining Hall, the cost for band camp participants will be covered. After dinner we will begin rehearsal, attire for band camp and practice throughout the year is blue bottoms and plain white t-shirts. No specific hues of blue, but please bring enough attire to last at least throughout the week. Anyone trying out for an auxiliary squad (Dancers, Twirlers, and Flags) will also report on Sunday, but each individual group will have their own tryout schedule. Unless you also play an instrument, any person trying out for an auxiliary group that does not make the squad will have to follow the freshman week schedule with all incoming freshman that are not participating in the band. Please confirm your receipt of this packet and also include your residence hall and room number. Send this information via e-mail to mbjones@vsu.edu. During the summer I am available mostly via e-mail, but you can leave a voicemail at 804-524-3697.